Triangle is the one geometric figure that is the most basic and simple one but. Our first encounter with triangles starts when we are in Pre-school and taught about various shapes through interesting activities. And as soon as we commence stepping up the stairs of our schooling years from 1st till 12th standard, each year we learn something new about triangles. We began this triangular journey with learning about the basics and fundamental properties of the triangle in our 2nd– 3rd std. to concepts of congruency and similarity in our high school. 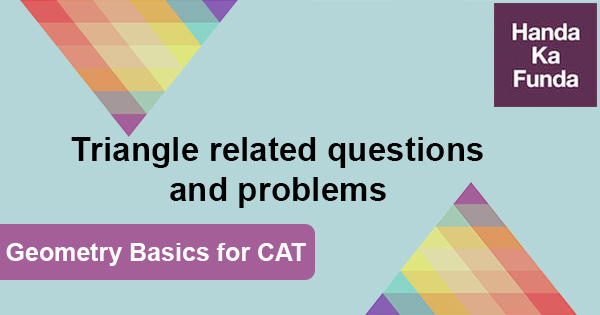 And since triangle and its theory played such a centric and imperative role in our curriculum of mathematics whole through our school life, it’s importance cannot be undermined and therefore, has crucial importance in competitive exams such as CAT, Bank PO etc. 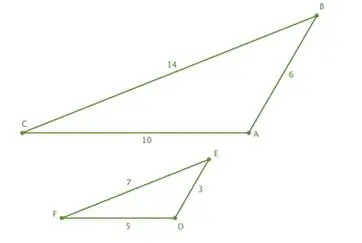 Each year questions related to the application of concepts of triangle comes in the quantitative section of these exams. Thus, in this blog, triangle and its theory are discussed ranging from the basics with distinct types of triangles to the rules of congruency and similarity. A triangle is a polygon with three edges and three vertices. It is formed by joining 3 non-collinear points in the 2-dimensional plane. And as the name itself signify the most elemental property of it i.e. 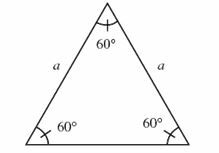 the word triangle comes from joining Tri with angle where tri means three thus it has 3 angles that sum up to 180o where the 3 angles are the interior angles of the triangle given in the figure below. And the sum of all the exterior angles is 360o. The sum of two sides of a triangle is always greater than the third i.e. 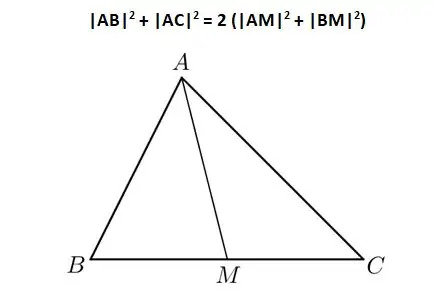 AB + BC > AC and the difference between the two sides is less than the third, AB – BC < AC. The measure of an exterior angle is the sum of two opposite interior angles. The side opposite of the biggest angle is the longest side and vice versa. Based on the length of a side. Based on the measure of an angle. where a is the length of the side. 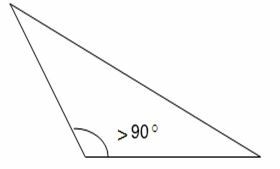 In an acute triangle, all the angles of the triangle are less 90o. An equilateral triangle is an acute triangle since all its angles are <90o. An isosceles and scalene triangle can also be an acute triangle. In this triangle, the length of two sides are equal and one is different. Also, the angles corresponding to these sides are also equal. 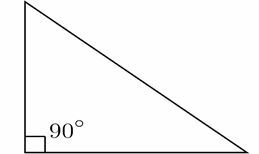 In an obtuse triangle, one angle measure greater than 90o. There cannot exist two obtuse angles in one triangle as the sum of all angles is 180o. Therefore, in the obtuse triangle one angle measure>90o and other two are acute. An equilateral triangle cannot be obtuse. In a scalene triangle, all the sides measure different from each other and for the same reason the angles are also contrasting. 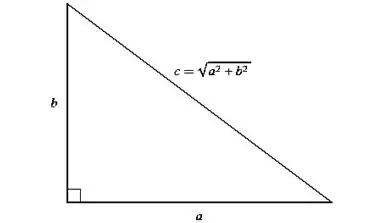 Now as we are done with describing diverse types of triangles we can move on to mensuration of triangles though, I have provided you some formulas and ways to measure the area of certain types of triangles but there’re many other methods also present in mathematics to estimate the area of triangles. In fact, triangles have the maximum number of ways to determine its area in comparison with other shapes. Following are the few ways that can be used to compute the area of triangle. You can evaluate the area of a triangle using trigonometric function sine as follows. Area of Triangle = abc/4r, where r is circumradius. Circumradius is the radius of the circle surmounting the triangle. 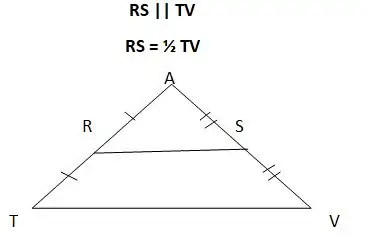 Area of Triangle = r*s, where r is inradius and s, is semi-perimeter. Inradius is the radius of the circle inside the triangle. Now, let’s move forward to understanding and knowing the difference between various line segments and centers such as Altitude, Medians etc. and Orthocenter, incenter etc. You all might have done questions and heard about them in your high school and many of you might be still confused with their terminology and basic differences among them. Given below is the table that lucidly describes each of its meaning. An altitude is a line segment which passes through any vertex and forms the right angle with the edge opposite to this vertex. 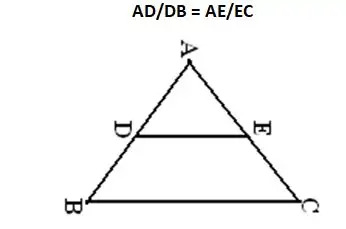 Here, AD, CF, and BE are altitudes of a triangle. The point of intersection of all the three altitudes in a triangle is known as orthocenter. 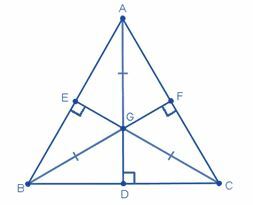 The orthocenter may lie inside or outside of the triangle depending upon the type of triangle. Here, o is the orthocenter. A perpendicular bisector is a line segment which passes through any vertex of a triangle to the mid-point of the opposite side and makes right angle with it. Here, AD, CE and BF are the perpendicular bisectors. 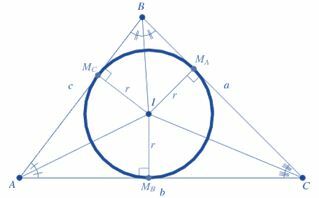 The intersection of all three perpendicular bisectors is known as circumcenter and it is also the center of the circle circumscribing the triangle. Here, G is the circumcenter. A median of a triangle is the line segment that joins any vertex of a triangle with the mid-point of the opposite side i.e. it divides the base to which it joins in two equal halves. Here, QU, PT, and SR are three medians. A triangle can have only three medians which intersect at the point known as the centroid. The centroid divides the length of the medians in 2:1 ratio. Here, V is the centroid. The angle bisector is the line segment that bisects the angle into two angles of equal measure of the vertex from which it is drawn. It is the intersection of the three angle bisectors of the triangle. It is also the center of the incircle of the triangle. Here, I is the incentre. We all did many problems and proofs of theorems and rules of congruency and similarity. Some of these important rules that might assist you in the exam are given below in the table. Two triangles are said to be congruent if they have the same size and shape i.e. all pairs of interior angles and corresponding sides measure the same. 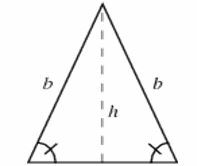 Symbolically, we represent congruency between two triangles through Two triangles are said to be similar if every angle of one triangle has the same measure in the corresponding angle in other triangle and the corresponding sides in both the triangles are in the same ratio. Two triangles can be proved to be congruent if two sides of a triangle are equal to corresponding sides of another triangle and the angle between them is also of same measure. 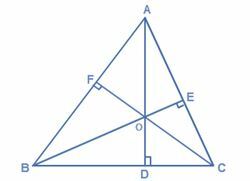 Two triangles are similar if two pairs of sides in the two triangles are in same proportion with each other and corresponding angles in between the sides are also of equal measure. Two triangles are congruent if all the three sides in one triangle are of the same measure as to corresponding sides in another triangle. 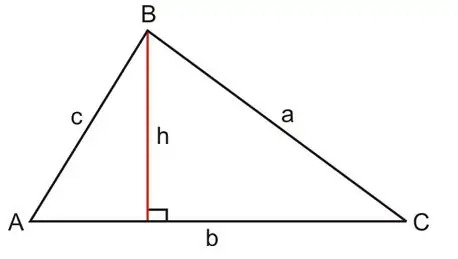 If the three sides of one triangle are in the same proportion with the corresponding three sides of the other then, they are said to be similar triangles. If in two triangles, two corresponding angles are equal in measure and one non-included corresponding side is equal in length, then they are said to be congruent and this rule is thus known as Angle-Angle-side. 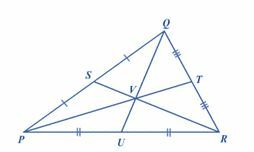 Two triangles are said to be similar if two pairs of angles are of same measure and this rule is known as Angle-Angle. This rule only holds for congruency. 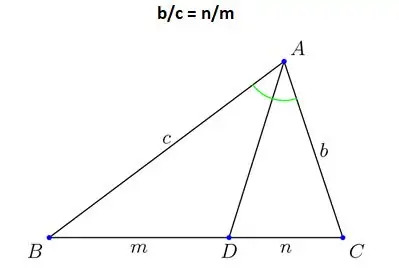 It states that if two angles and included side in between them in one triangle are of equal measure to corresponding angles and side in the second one then, they are congruent. There’s no such rule applicable for similarity. We all know there’re innumerable theorems and postulates in mathematics and a few of those were taught us during our school time. And many of these theorems were related to triangles so some of them that hold substantial importance are mentioned below. This theorem has paramount importance in the field of geometry with wide application and uses in many questions and theories. This article has included all the details and concepts of triangle now you must learn their application and that comes with practice as “Practice is a means of inviting the perfection desired”. 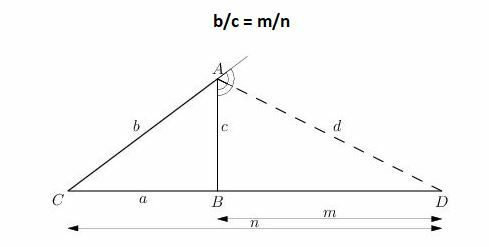 Quantitative Aptitude – Geometry – Triangles – Q3: From a triangle ABC with sides of lengths 40 ft, 25 ft and 35 ft, a triangular portion GBC is cut off where G is the centroid of ABC. Quantitative Aptitude – Geometry – Mensuration – Q2: A ball of diameter 4 cm is kept on top of a hollow cylinder standing vertically.